Do you ever wish that future you would visit you right as your about to make a big decision to tell you how it went? They could tell you the traps to look out for, what you are going to do really well, and give you an idea if it was a great success or a huge failure? Unfortunately, that’s just not how it works. We get to go ahead and learn as we go. I thought I had a pretty good idea of what I was doing when I started homeschooling 10 years ago. While I’ve certainly enjoyed the journey, here are some things I wish I would have known (or advice I should’ve listened to) when I started homeschooling. 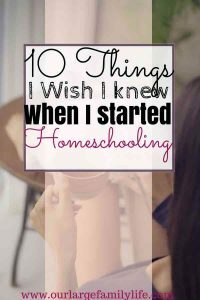 10 Things I wish I knew when I started Homeschooling. When first started homeschooling I had no idea where to start when it came to curriculum. My MIL told me what she used and so that’s what I started with. I couldn’t even begin to think about the options out there. And there are definitely more options now than when we started. We have to be careful. We can easily turn curriculum into an idol. We can start to judge others on the curriculum they use or have serious FOMO (fear of missing out). But here is something I’ve noticed. Curriculums, for the most part, teach the same thing. History is going to have the same facts. Science is going to have the same facts. Math has the same facts. The stories and plays always end the same way. Don’t get hung up on the curriculum. Find something that works for your family, worldview, and budget. Young kids learn best through play. It’s so easy however to get sucked into them needing to be able to read and do numbers when they aren’t ready. This leads to a frustrated mom, a frustrated child, and successful homeschooling seeming like a dream. The more kids I’ve homeschooled, them more I have seen the benefit of letting kids take learning at their own pace. That’s why we homeschool, right? I spent a lot of time stressing over letter sounds and numbers when the kids could have been outside counting bugs or flowers. Realizing how good it is for young kids to have plenty of time to play is something I wish I would have let my older kids do. Homeschooling is as different as there are people doing it. It’s so easy to look at what everyone else is doing instead of running your own race. While it’s great to draw inspiration from other homeschoolers, don’t worry too much about how they do it. You are the mother of your children. No one knows better than you how they learn, what they want to learn, or when the best time for them to learn is. It’s ok if your homeschool journey doesn’t look like everyone else’s. Focus on doing the best you can for your family and your situations and you will succeed far better than trying to imitate someone else. Everyone loves to give advice. Receiving advice, however, is not always as fun. If you homeschool though, you will be giving plenty advice. There are blogs, podcasts, books, speakers, ….. that give you advice on homeschooling. But just because someone gives you advice on how you do something in your homeschool, does not mean you have to take it. Some of it may be great, and that’s awesome. Most days we feel like we need all the help we can get. Don’t feel guilty about not following everyone’s advice. Guilt helps no one. I want you to feel confident in your homeschool and you can’t do that if you are constantly worried about not doing all the things you are advised to do. Instead, focus on you and what works for your family, and leave the rest. I really hate to admit how much control we have over the attitudes of our homes. If we wake up grumpy and tired, we can’t be surprised when the same happens with our kids. I spent most of the winter in my sweats and sometimes didn’t change out of them for days. Soon enough my kids complained about how they didn’t want to get dressed since we were going anywhere. The best way to fix this was for me to start getting dressed every day and guess what? No kickback from anyone about getting dressed as soon as I was doing it. Our attitude and actions are what our kids are going to follow. When homeschooling our kids it’s easy to get caught up in what they have to learn, that we forget how much fun it can be to learn about things we are interested in. Kids are the same way. Letting them choose what subjects they want to learn about, makes learning fun, easy, and requires less effort on our part as they are more willing to do the work. Instead of focusing on what we aren’t getting to, let’s be thankful they have found something that interests them that they want to learn about. They will actually learn quite a lot about how to learn. Knowing how to learn that is something that will carry them farther in life than the subjects or topics we may have missed out on. One of the biggest lies we tell ourselves as mom is that we will always have more time with our kids. We know this is false and yet we continue to tell ourselves that we can spend time with the kids after _____ is done (school, chores, activities). As we get closer to graduating our first child I am realizing how quickly that time is going and how quickly it will continue to go. It feels like time is speeding up but my actions aren’t catching up. Spend more time reading and less time stressing. More time walking in nature and less time worrying about if they did enough math facts today. This is our time to build lifelong connections with our children before they leave our house. Trusting God is always the hardest, but also the most important. If he has called you to homeschool, then he has equipped you as well. Instead of trusting in our curriculums, or advice people gives us or the activities, trust that God is going to help these children we are teaching to grow, remember, and learn. Homeschooling is fun. I absolutely love learning and reading with my kids, but I don’t always have fun with it. Do the messy activities and science projects. Sing songs. Makeup games. Write silly stories. Sometimes with all the other pressures, we have around us, it can be hard to remember to take the time to make learning fun. Homeschooling has been one of the best decisions we have made. I do not regret it at all. There are so many distractions to get caught up in, however, that we can lose sight of why we decided to homeschool in the first place. Trusting God and trusting yourself are the biggest things you can do to successfully complete your homeschool journey. Focus more on your kids and less on what everyone else is doing. Theodore Roosevelt is credited with the quote, “Comparison is the thief of joy.” That can certainly apply to our homeschool journey. Run your own race. Have fun. Search for advice and encouragement when you need it. What do you wish you had known when you started homeschooling?